According to the U.S. Department of Labor, Bureau of Labor Statistics, in 2016, the average employee tenure was just 4.2 years. But Ruth Pappas-Roe, who recently retired from Michigan Paving & Materials, is not average. Actually, she’s far from it! 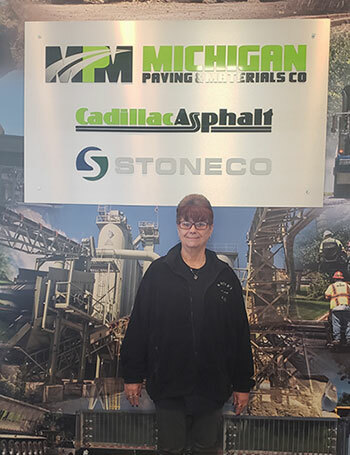 Pappas-Roe was a treasured member of the Michigan Paving & Materials team for more than 32 years, serving our clients with a smile and looking after coworkers like family. As the mother of three and grandmother of five, Pappas-Roe knows the value of teamwork and was always ready to go above and beyond in her position as Accounts Receivable Clerk in the A/R Department. Now, she’s looking forward to a little less work and a little more fun! Among her plans are traveling to Las Vegas, visiting her sister in Florida, taking a cruise, and hopefully returning to Hawaii. Closer to home, Pappas-Roe plans to spend more time with her grandkids, volunteer to help the elderly, and when the weather warms, take on spring cleaning! Growing up, Pappas-Roe thought she might be a teacher or a flight attendant, so we at MPM are grateful she chose to spend her career with us. She also concedes the things she will miss the most about working at MPM are the people and all the good times had. Looking back, she said if she could give her 16-year-old-self a piece of advice, it would be “to take one day at a time.” As she moves forward into her well-earned retirement, we wish her each day jam-packed with fun, family and fulfillment!